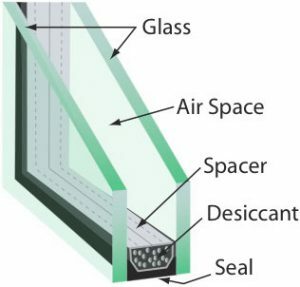 Insulated Glass units (IGU) are factory ordered and can be made up to many different thicknesses and constructed with a variety of glass types and profiles. From the most basic IGU for new construction or repair work to the special make up units for security applications, we can fulfill your requirements. Insulated glass units, size and application dependant, can be made using many different glass profiles from s/b glass, d/s glass to 1/4″ monolithic to 1/2″ laminated glass and many other options. IGU products can be fabricated with Grids between the glass lites to give the look of divided lites and can be supplied with Low E coated glass, obscure glass, tinted glass and reflective glass. Please feel free to call with any questions regarding your Insulating Glass Requirements.